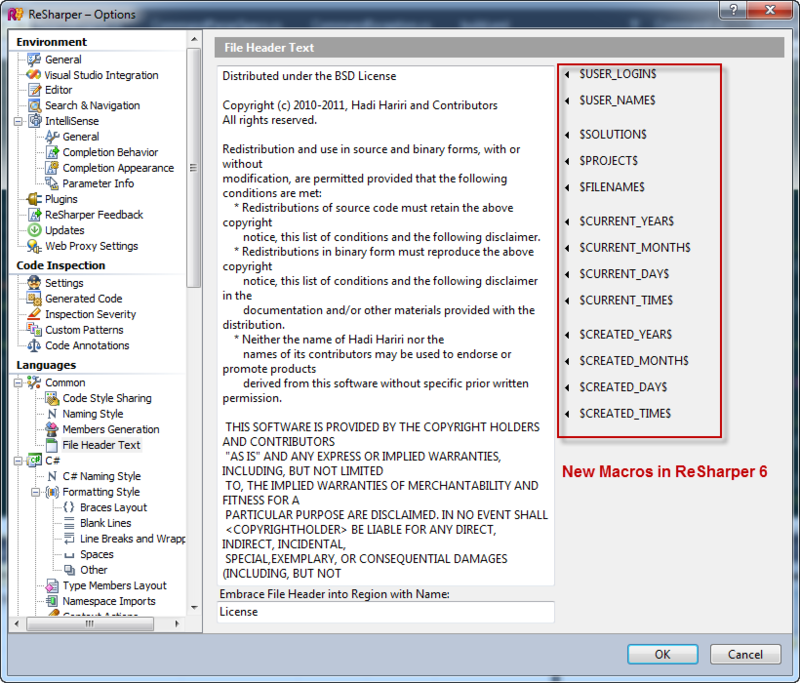 For instance, in the previous license header, the Copyright years are fixed to 2010 – 2011. It also has no information relevant to the actual project. We could of course hardcode the name of the project in there but since this setting is not solution-specific, it would be of little use. Other data such a filenames however would be impossible to do. With this change in place, next time we run a code-cleanup and have the Update File Header option activated, we will get up to date and project/file specific header information inserted. Next feature request: Custom Macros! Unfortunately, enabling file header addition/update seems to cause R# to always modify the file during clean-up, even if it has not materially changed the contents, and this is a step backwards from pre-6 versions of R# which would leave the file alone if clean-up would not change anything. It is a relatively minor issue, but I do hope that this gets addressed in a patch, as it removes the previous ability to instantly know if a clean-up operation has changed the file or not. Could you please log it with a test case to reproduce in http://youtrack.jetbrains.net/issues/RSRP ? $USER_NAME$ is always empty for me, though $USER_LOGIN$ is not. How do I set $USER_NAME$? The same for me. Why $USER_NAME$ is empty? How can it be set? The $USER_NAME$ field maps to the display name of the current user. Under the covers it calls Win32’s GetUserNameEx method, passing in EXTENDED_NAME_FORMAT.NameDisplay. If your account doesn’t have a display name set, it will display an empty string. Setting the display name depends on the type of account you have – a local Windows account can be set on the local machine, if you’re on a domain, I suspect it will have to be changed in Active Directory. If you get an empty string for $USER_NAME$, you might want to use $USER_LOGIN$ instead. This shows the user’s login name, rather than the display name. It would be nice if this had source control macros that linked to TFS, if TFS supports that. Then it could show (as SourceSafe used to do) things like $last_checked_in$ and so on. Just an idea.